Originally I was going to make these cookies with just the eyes and a smile, but then realized that I had some mustache sugar decorations stashed away, no pun intended, and the little flower sprinkles for the cactus blossoms. Much better! These guys make me chuckle! 3. Cut out cookies with cactus cutter and place on baking sheet. 4. Bake cookies according to recipe and then let them cool. 5. Tint the royal icing green. 6. Using a #3 tip, outline the cookies and fill with the royal icing. 8. Using the green food marker, detail green lines down the cactus. 9. Put a dab of royal icing on the backs of the sugar decorations/sprinkles and place on the cactus. 11. With the royal icing and a #1 tip, add the spines (needles). You are so good at decorating cookies! These are so cute. Perfect for Cinco de Mayo, love those smiling faces! 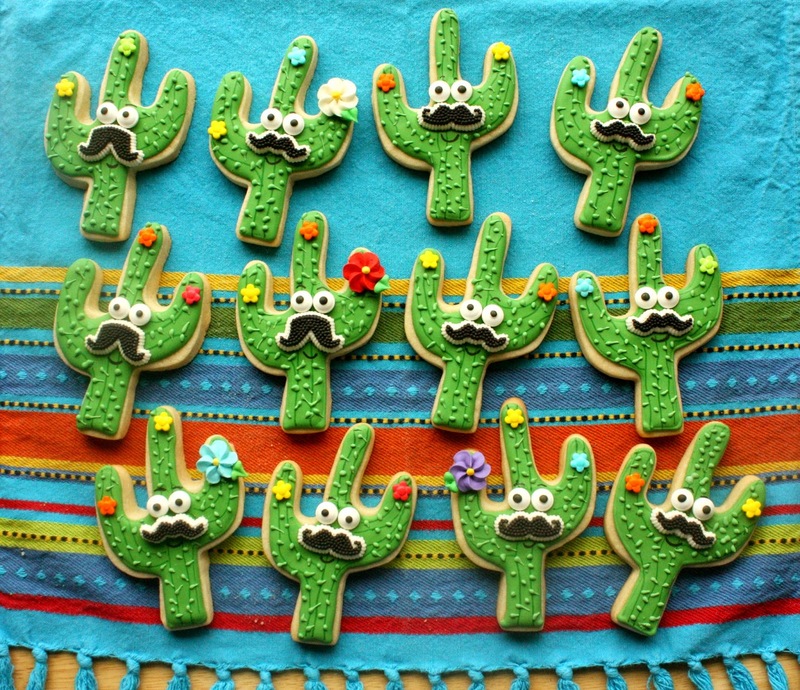 I love these silly, mustachioed, adorable cactus cookies! Ole'!! Oh my stars Sue! These cookies will definitely 'stick' with me! I love all the details. The mustaches and the flowers really make them special. I always love how simply adorable your cookie creations are!